C'est le jour J dans Gouin. Gabriel Nadeau-Dubois devrait être élu ce soir et fera ainsi son entrée à l'Assemblée Nationale. Tel que je l'avais déjà écrit, la victoire de GND ne fait aucun doute. La vraie question est vraiment de savoir son pourcentage de votes. J'ai décidé de faire une mise à jour pour deux raisons. Premièrement, l'un des habitués de ce blogue, Robert Lachance, a posté des info intéressantes concernant les "likes" sur facebook pour les divers candidats. L'autre raison est la couverture médiatique entourant QS et son refus de signer l'entente OUI pour la souveraineté. Mais ces projections sont pour une élection générale. Premier ajustment: le fait qu'il y a 13 candidats, dont certains qui devraient être capable de faire plus que 0.5%. Vanessa Dion d'Option Nationale ainsi qu'Alexandre Cormier-Denis (Parti Indépendantiste) semblent les mieux placés (parmi les petits candidats). En termes de mentions "j'aime" sur leur page facebook, ils sont en effet devant le candidat PLQ! S'il y avait un lien 1:1 entre mentions et votes, ces deux candidats pourraient espérer récolter aux alentours des 8%! (Et GND 75% en passant). Ajoutons à cela Alex Tyrrell, chef du Parti Vert qui semble se présenter dans toutes les partielles (il était dans Arthabaska en décembre)! Les souverainistes durs devraient se rabattre sur ces deux options. Aussi, on peut imaginer certains Péquistes puisque leur parti avait décidé de ne pas présenter de candidat. Mettons que 40% des électeurs qui auraient voté PQ décident d'aller voter (au lieu de rester à la maison), cela fait 11% de voix. Le 8% pour ces deux candidats est tout à coup bien plus probable. Si l'on y va avec entre 0.5 et 1% pour les petits candidats (à part les deux mentionnés) et un report de ces 11% provenant du PQ, On voit que les "autres" pourraient être à près de 20% au total! Il y a une semaine de cela, j'aurais écrit qu'une partie des électeurs PQ voteraient pour GND. Mais j'en doute maintenant. Finalement, les partielles ont des taux de participation plus faibles (en général 50% du taux d'une élection générale). Les partielles sur l'île (SHSA et Verdun) ont même eu des taux plus bas. Surtout, il n'est pas rare de voir un ou deux partis mieux faire sortir leur votes que les autres (souvent par un manque d'intérêt). Partons du principe que QS fera sortir son vote davantage que les autres (genre 70% au lieu de 50%). Ok, récapitulons. Je prends les projections comme base, je corrige ensuite pour le fait qu'il y a davantage de candidat (dont 2 "petits" qui pourraient bien faire) et je corrige pour le fait que le PQ n'a pas de candidat et que certains de ses électeurs se reporteront sur les autres choix souverainistes (et pas QS, pas après cette semaine et le congrès où les membres QS ont refusé de même entâmer des négociation). Finalement, je fais l'hypothèse que QS sortira davantage son vote que la CAQ par exemple. Il y a plein d'hypothèses partout, mais voilà, on fait ce que l'on peut. GND devrait être entre 55 et 60%. Le PLQ vers les 8-10%, tout comme la CAQ. La catégorie "autres", incluant ON, pourrait atteindre les 20%! Surtout en cas de faible participation (car chaque vote comptera davantage alors). Il existe un scénario où GND récolterait plus de 65 ou même 70% des votes. Imaginons un scénario où QS est bel et bien à 13-14% provincialement et fait sortir son vote massivement. Aussi, dans ce scénario, les Péquistent restent chez eux en l'absence d'un candidat (ou certains votent pour GND!). Au final, je dirais qu'une victoire vers les 60% est un résultat satisfaisant pour GND. Au-dessus de 60% et ce serait une belle démonstration. À l'inverse, un résultat sous les 50% devrait être considéré comme une contre-performance. D'autant plus que QS a souvent réussi à faire mieux que prévu (dans SHSA et Verdun). Il serait un peu surprenant que le nouveau porte-parole super populaire du parti fasse pire que prévu. Andrew Scheer is the new leader of the Conservative Party. His victory is a relatively big surprise. In terms of odds, I had him with around 20% chances (actually 25% the last time I ran the simulations but I never published these odds, so that's not fair). So that's more than what the BC Liberals had in BC in 2013 (15%) and less than what Nate Silver was giving to Trump (around 30%). This should put things in perspective. As usual after a mistake or error of the projections, the question is: what could I have done differently? In this case, honestly, not much. Some people have called this race unpollable and while they will feel vindicated by the fact Bernier lost, I think this is an overstatement. The fact is that polls (and fundraising data) were able to predict this race fairly well. Except in one province. So, why the surprise? The short version is that the farmers in rural Quebec managed to gather against Bernier (who wanted to end supply management). I was aware of the movement against him but data was still showing a large and comfortable lead in Quebec for Bernier. We can also mention the social conservatives (So-Cons) whose second choices ultimately helped Scheer. But the impact was much smaller than the under-performance of Bernier in Quebec. Plus, the model was actually factoring in the fact that Trost and Lemieux supporters would go more towards Scheer than Bernier. Here below you have the results by province (the main ones) for Scheer and Bernier for the first round, compared to the latest Mainstreet polls as well as my own numbers (which were a mix of fundraising and polling data). Mainstreet was closer (which makes sense given that they had access to data I didn't, like the number of members per riding). Still, you can see that Scheer beat the polls/projections in many places, including Ontario and BC but especially Quebec (and Bernier did worse). By the way, it's surprising that Mainstreet was closer overall but was giving lower chances of winning to Scheer than me (they were giving him 15%). I think their model simply had less uncertainty than mine. Also, remember, my model was free when their cost $100 a month just to access (at the same time, I thank them for at least providing some polls). Let's focus on Quebec alone. In terms of points, the polls and projections (averaged) were predicting Bernier to get 3826 points and Scheer 1275, a lead of over 2500 points (in the first round and in Quebec alone). What actually happened is Bernier got only 3073 points and Scheer got 2161, a lead of of only 912! This, right here, is why Andrew Scheer is now the leader and not Bernier. As a matter of fact, Bernier could have won with around 160 more votes in some key rural ridings in Quebec (in some, each vote represented around 2 points given the low number of members!). Things get worse for Bernier when you realize that he actually lost his own riding in Beauce to Scheer! It's literally possible that a 100 votes in his riding (plus 100 elsewhere in Quebec) could have decided this race! So again, was it predictable? Hindsight is 20/20 but we simply did not have any indication that Bernier would win Quebec by so little. Not the polls, not the fundraising. I'm sure there are people out there saying "I called it". Well, good for them. But allow me to be skeptical. Yes we knew the farmers didn't like Bernier's plan but to think that this would be enough to cut his lead (in points) by more than half? Never. I think it's pretty close overall. Lemieux is too high and I knew it (I mentioned it) and Trost too low. Scheer is slightly outside of the confidence interval but remember that intervals are at 95%, not 100%. 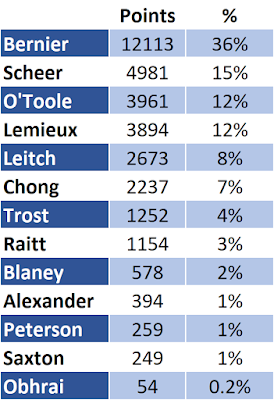 There are only really 2-3 cases where the transfers really helped Scheer: from Lemieux and Trost (and O'Toole but at this point, some of his votes were coming from Lemieux and Trost). I tweeted that Bernier's lead was stable at 6-7 points for like 6 rounds. The model was predicting this. For instance we had that Lemieux supporters had Trost and Scheer as main second choices. Qualitatively the model was sound. Quantitatively? It was closer than the transfers observed in the actual results. Maybe the one mistake I made was not to update enough the second choices. For instance, once Lemieux was eliminated and a lot of his supporters were with Trost, I could have made is such that even more Trost supporters would have Scheer as second choice. I didn't do that. Why? Well, first of all, these second choices were tricky to estimate and I had very limited data. Secondly, Bernier's lead was supposed to be big enough (thanks to Quebec) to survive a transfer of vote going 60% for Scheer and 40% for Bernier. The 60-40 split is exactly the split observed yesterday after the first round until the 13th. Some of these transfers can be due to attrition (some ballots were dropped since they only had 1 or 2 choices). My simulations, in average, where increasing Sheer's points total by 9489 points between the 1st and the 13th round while Bernier's total was only increasing by 6243. In percentage, this gives 60% to Scheer and 40% to Bernier! So really, if you are looking for a reason as to why my projections failed, the redistribution of votes isn't where it happened. At the end of the day, I think the comparison to Trump is an appropriate one as far as the level of surprise that was the Scheer victory (Note: do not read in this statement that I'm comparing Scheer to Trump. I'm not. Because I'm not a moron). Like Trump, the numbers were showing that Scheer could win, it just required a number of things to happen. A number of unlikely things based on the available information. The predictions failed to see the Trump victory because he needed to win a couple of States that were unlikely based on the polls. For Scheer, the fact that he did so well in Quebec (and Bernier so bad, relatively speaking) is by far the biggest reason the upset happened. Also, let's remember that when my model gives a 20% chance of something happening, it means that, well, such an event should happen 1 out of 5 times. In other words, there is something wrong with a model where the favourite always win. But obviously it doesn't look (or feel) good when the upset happens. Mainstreet just released its latest poll for the CPC leadership that is ending this Saturday. With that said, I'm not sure a last minute poll is that useful given that most members mailed their ballots already. But based on Mainstreet's numbers, even the last minute trend is favourable to Bernier (and not to Andrew Scheer). On the other hand, we finally have a regional breakdown provided for free (i.e: without paying $100). I decided to keep using my model with the fundraising data but it convinced me to update the projections. In particular, I realized I might have overestimated Bernier in Quebec. And since this province is so important, any adjustment made there can have dramatic consequences on the overall picture. I thus updated my projections of earlier this week (read for the detailed methodology). The main result remains: Maxime Bernier will be the next leader of the Conservative Party. Look, we can do the simulations, keep in mind how tricky a leadership race is and how the electoral system (and the incorrectly filled -and therefore invalid- ballots), but Bernier is by far the favourite here. It'd be shocking to me if he were to lose this weekend. The number of points is really similar but the chances have changed. Since Scheer is higher in Quebec (and Bernier lower), it makes the race slightly more competitive. Still, make no mistake, for Andrew Scheer to win, he needs the poll and fundraising data to be wrong, very wrong. I said it before and I'll say it again: if you don't believe my projections, simply think about it: Bernier will almost surely get around 50% in Quebec. Unless his vote is incredibly inefficient (remember, each riding is worth 100 points), it means Quebec alone will provide him with around 3500-4000 points in the first round. This alone pretty much guarantees Bernier to be ahead after the first round. This is, after all, more points than any other candidate is projected to get across the entire country, except for Scheer (and maybe O'Toole and Lemieux who are both right around 4000 in average). 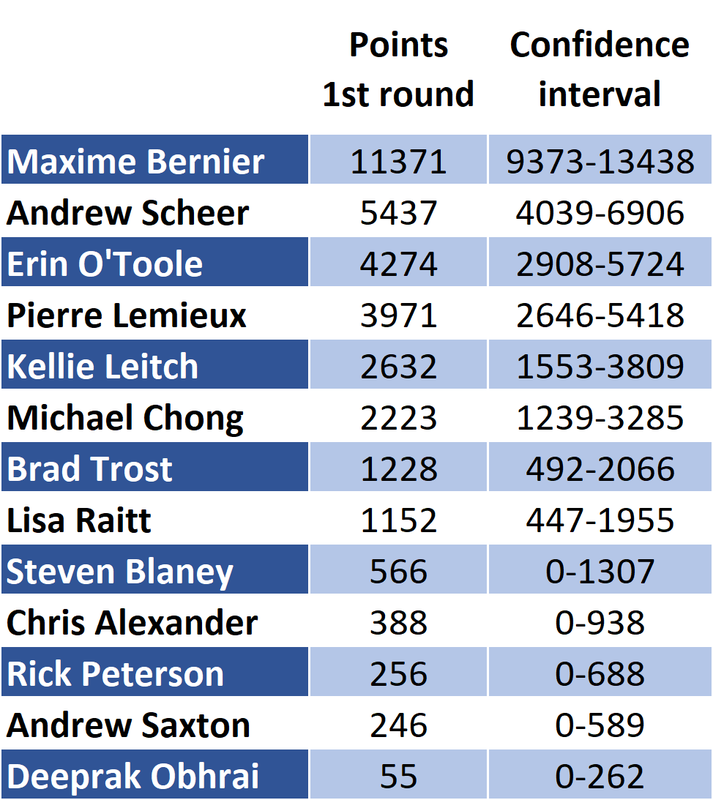 Bernier will likely not win in the first round, which means that we'll go through a number of "useless" rounds where we redistribute the votes of the candidate who finished last. But there will be so few votes (or points) to redistribute that it won't change anything to the big picture. It will only get interesting around the 7 or 8th round (so when we'll likely be eliminating Trost or Raitt). Again, if you think I'm too confident for Bernier, remember that I introduced a ton of uncertainty into the simulations. I also made some adjustments to the fundraising data based on the polls that are helping Scheer and hurting Bernier. I even didn't mostly used the next to last Mainstreet poll (instead of this one here) because it was better for Scheer (well, that's not really the why. I used the next to last poll because I don't think a last minute poll is useful when members have already voted). The Mainstreet regional breakdown also shows that Bernier is ahead pretty much everywhere except in Saskatchewan (province of Scheer). Another indication of the fact Bernier is likely to win. Some will argue that the first round isn't what really matters. Based on the ranked ballots used, second (and third, fourth, etc) choices are really important. This is only partially true. For a candidate to rally from behind, he needs to benefit from a systematic and massive report of the votes of other candidates. It likely won't happen here because members had to indicate all their choices at once. And sure, you can start arguing that Chong supporters might be more likely to support O'Toole than Bernier or Leitch based on policies, but remember that real life second choices are seldom that clear and "reasoned". You know, that's the same logic that a NDP voter can't have the Conservative as second choice. Except it happens. I'll say this, I'm absolutely shocked that no candidate officially made a deal with another. Like telling his or her supporters to put another candidate as second choice. But hey, between this race and what Quebec Solidaire chose this weekend, it seems Canadian politicians don't like to make deals. At the end of the day, I have no reason to believe Bernier isn't a popular second choice. And since he'll finish comfortably ahead after the first round, he will very likely not be caught and ultimately win. In my simulations, the only way Bernier loses is if the polls/fundraising data were wrong and wrong pretty much in every province. Anyway, we'll see this weekend. Last time I tried to predict a leadership race (the PQ last year), I got the right winner (despite every single poll showing otherwise) but I was quite off in terms of percentages. At the same time, my biggest achievement in electoral prediction was when I had correctly called Stéphane Dion to win the LPC leadership. So far, leadership races have been good to me. Commençons par dire tout haut ce que tout le monde sait déjà: Gabriel Nadeau-Dubois va remporter l'élection complémentaire dans Gouin lundi prochain. Il n'y a aucun doute là-dessus, d'autant plus que le PQ avait décidé de ne pas lui opposer de candidat (j'imagine que la décision serait tout autre si le PQ devait décider aujourd'hui). La vraie question concerne l'ampleur de la vitoire de GND. Ci-dessous vous avez ce que j'appelle le "orangeomètre". Il s'agît d'une échelle-mesure pour déterminer la performance du nouveau venu chez QS. Une victoire avec moins de 50% serait une déception et contre-performance pour lui. Voyez les scénarios ci-dessous pour les explications. Si vous ne voulez pas lire, en gros, GND se doit de récolter au moins 60% des voix. Une victoire aec "seulement" 50% ou moins serait décevante. Premièrement, il y a un nombre incroyable de candidats! Ils sont en effet 13 à vouloir être élu, y compris un représentant de l'Équipe Autonomiste, un du Parti Indépendantiste ou encore un gars du Parti Libre! Il n'y avait que 6 candidats dans Gouin en 2014. Tous ces petits candidats n'ont aucune chance mais ils ne feront pas non plus tous 0%. Collectivement ils pourraient faire disons 6-7%. Cela représente 0.5% en moyenne par candidat. Cela semble raisonnable. Gardons cela en tête. Prenons les plus récentes projections comme point de départ. Dans Gouin, nous avons QS à 60%, le PQ 2e à 17%, ensuite la CAQ à 13% et le PLQ à 8%. Le 60% pour QS est basé non seulement sur les intentions de vote au niveau provincial (QS entre 13 et 14%) mais les résultats précédents de Françoise David. Cela est un élément important car en tant que deuxième députée de QS (élue en 2012 avec 46% des voix), elle a fort probablement un effet personnel important. Si son remplaçant était simplement un candidat "ordinaire", je devrais ajuster les résultats. Mais GND est pas mal une rock star en terme de popularité. Les intétentions de votes pour QS ont augmenté depuis son arrivée et le nombre de membres a explosé. Ainsi, je crois que l'on peut au minimum partir du principe que GND ne devrait pas faire pire que Françoise David. Cela étant dit, mes estimations montrent un effet personnel pour madame David d'environ 10 points au moins (avec QS, il est toujours difficile de déterminer s'il s'agît d'un effet personnel ou d'une grosse campagne du parti). Une élection partielle a presque systématiquement un taux de participation plus faible (en général depuis 2014, on parle d'un taux 50% plus faible). Celle-ci ne devrait pas faire exception à la règle. Google Trend nous montre que GND avait généré un gros buzz à son arrivée mais pas durant la campagne. Il est populaire mais sa campagne ne semble pas avoir généré un intérêt fou. Faut dire que c'est difficile lorsqu'il n'y a pas vraiment de course. QS devrait cependant être capable de faire sortir son vote. Ce parti (et GND lui-même) ont intérêt à avoir une victoire claire et impressionnate. Mais ce sont les autres électeurs qui risquent de rester chez eux, en particulier les électeurs Péquistes. Avant le rejet d'une entente (ou plutôt de négocier une entente) avec le PQ, on aurait pu imaginer certains Péquistes voter pour GND en l'absence d'un candidat de leur parti (dans les faits, Gouin était un bon test pour voir si les électeurs suivraient). Mais après la fin de semaine passée, j'en doute un peu. Je crois que les électeurs qui sont attirés par GND sont déjà à QS (d'où ce parti étant à 14%). Ok, regardons donc trois scénarios. 1) QS fait sortir son vote, les autres non. Les Péquistes restent chez eux. Cela peut sembler incroyablement élevé mais pensez-y, vous avez un candidat super populaire qui se présente dans un comté qui est maintenant très orange et son principal adversaire (le PQ) ne présente pas de candidat! Ajoutez à cela le fait que, dans les partielles, les partis qui ne peuvent pas gagner font en général moins sortir leur vote (sauf le PLQ, enfin ça dépend), et vous avez tous les ingrédients pour une victoire énorme de GND. Dans ce cas-là, les projections basées sur les deux derniers sondages seraient valides (en fait chaque parti serait un peu plus bas en raison du nombre plus élevé de candidat, mais cela ne fait pas une énorme différence). Dans ce scénario, GND l'emporte avec environ 55% des voix. Avec plusieurs candidats indépendantistes ou encore la CAQ, les électeurs PQ ont l'embarras du choix. Dans ce scénario, les 13% du PQ vont à d'autres partis. Dans ce scénario, GND est juste au-dessus des 50% ("juste", pour n'importe quel candidat, remporter plus de la moitié des votes est majeur). Les trois scénarios représentent pas mal l'intervalle entre le meilleur et le pire. Comme vous pouvez le voir, je ne peux pas vraiment imaginer un scénario où le nouveau co-porte-parole de QS ne rempote pas ce siège. On pourrait certes imaginer des scénarios plus extrêmes. Par exemple: QS fait sortir son vote, GND a un effet personnel encore plus grand que Françoise David et certains Péquistent votent pour lui: GND est au-dessus des 80%. Ou un pire: GNA perd l'effet de David, les électeurs PQ se reportent sur d'autres et certains QS sont fâchés après le rejet de l'entente avec le PQ, donc GND est à 40%. Mais cela devient très peu réaliste. Au final, je crois que GND a de bonnes chances d'avoir le scénario 1. Ou du moins d'en être proche. À tout le moins, je serais surpris pas une victoire avec un résultat sous les 60%. Après, pour QS et GND, ce n'est que la première bataille. Il faudra ensuite maintenir ce momentum pour aller chercher 4-9 sièges en 2018 (et ainsi ne pas regretter le rejet de l'alliance avec le PQ). Better late than never, right? 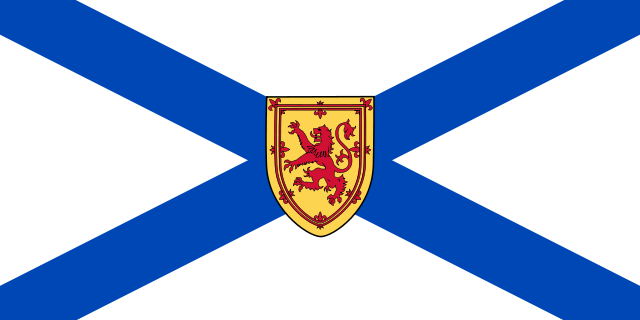 Here is the first version of the simulator for the Nova Scotia election. I'll keep updating it. I'll also likely provide official projections but not tonight. Note: si vous voulez une version plus courte mais en français, cliquez ici. The Conservative Party members are choosing their new leader in 4 days. Polling data has been rare (and expensive to access). Some have even said this race was unpollable because of the closed nature of the race (only members can vote) and the electoral system chosen. This is why I decided to use the same indicator as for when I covered the PQ leadership race last year: fundraising. Mixed with the available polling data, I think Maxime Bernier is by far the number one favourite to win on the 27th. - Maxime Bernier is ahead in both the polling and fundraising data. And the only threat he was really facing (Kevin O'Leary) dropped and officially supported him. - The electoral system (giving a 100 points to every riding no matter how many members it has) is giving Quebec a very important role (6% of the membres but 23% of the points!). Bernier will take advantage of it as he'll easily win his home province. - Second choices are unlikely to allow one candidate trailing to climb back up because members have to indicate all their choices at once and no formal deal was made between candidates. Also, we have no reason to believe Bernier isn't doing well for the 2nd, 3rd, etc, choices. On the contrary. Before going into the details, here are the projections for this race. You have the chances of winning as well as the confidence intervals (at 95%) for the first round. Compared to the Mainstreet numbers, Bernier is higher. His lead in the fundraising has always been bigger than the one he had in the polls. Also, Bernier will benefit from the efficient votes from Quebec (worth a lot of points). Scheer dominates his province (Saskatchewan) but nowhere else. Actually, if I was only going by the fundraising data, Scheer wouldn't even be top 2. But I can't ignore the rising trend observed in the Mainstreet poll for him since early April. Leitch would be the main contender to Bernier based on the fundraising data, but she has been polling consistently low with Mainstreet and she's decreasing over time. Lemieux is here and this is a little bit surprising. But he has more donors than Scheer (although he raised less money). Also, the temporal adjustments based on the trend in the the Mainstreet polls (see detailed methodology below) has him increasing since April. Still, I wouldn't be surprise if the model overestimates his result but I won't modify the numbers arbitrarily. Finally O'Toole is currently in the top 5. His performance is similar to Scheer: polling better than fundraising and on the rise since early April. Here are the possible results after the first round. This graph should convince you of the lead of Maxime Bernier. Even in his worst case scenario, he's still ahead. And that's with simulations including a ton of uncertainty, way more than what I usually do for a typical election. If you think the advantage of Bernier isn't as big as what is shown here, think about this: thanks to Quebec, he'll likely receive at least 4000 points from this province alone, in the first round alone (he'll get 50% of the votes if not more). 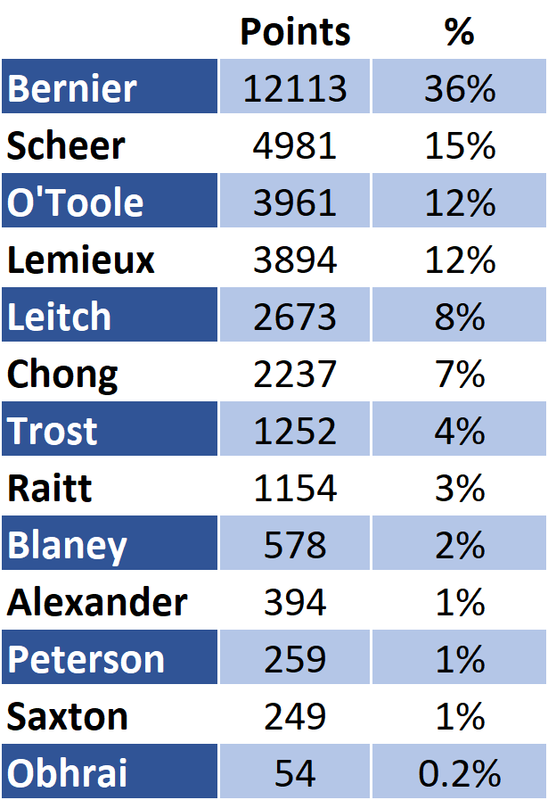 That is more points than all the other candidates are projected to receive Canada-wide, except Andrew Scheer! Quebec gives Maxime Bernier a huge advantage, one that is, quite frankly, most likely enough to give him the leadership. With the redistribution of the votes of the candidates once they are eliminated, we could imagine Bernier reaching 6000 points in Quebec alone, more than a third of what is required to win overall. Also, O'Leary was polling higher than Bernier and raising just as much. But he officially threw his support behind Bernier and it seems that at least 40% of his supporters are following through. Something that isn't surprising since the fundraising data regarding multi-candidates donors was indeed showing a strong link between Bernier and O'Leary supporters. Still, Bernier is highly unlikely to win in the first round. His polling/fundraising numbers are too low and there are too many candidates that split the vote. This means the candidate who finished last will be eliminated and his/her votes redistributed. And so on. So, could Bernier "pull an Ignatieff" and win the first round but lose at the end? It's possible but highly unlikely for multiple reasons. First of all, all the data available shows that there is no "anybody but Bernier" sentiment among the CPC members. Bernier is actually quite popular as a second choice. Fundraising data of multiple-candidates donors (people who gave money to more than one candidates) shows that. Polling data too. Secondly, Ignatieff lost to Dion for the Liberal leadership because the LPC was (back then) using actually delegates to vote. They had to physically be in Montreal and vote multiple times. So when Gerrard Kennedy threw his support behind Dion, he could literally tell his delegates who to vote for. But the CPC race this year isn't like that at all. Members have to indicate their subsequent choices right away. And we haven't seen any formal alliance between candidates. So I think it's highly unlikely that we'll see the second choices leaning heavily for one candidate. When Dion won, over 90% of the delegates of Kennedy followed through and supported Dion. This is the type of rate you need if you finish 15 points behind and are hoping to climb back. But even if the second votes (by second, I also mean 3rd, 4th, etc) were to favour Scheer 60-40, that would likely not be enough to catch Bernier. By the way, it seems the ballots were so complicated that as many as 20% of them will not count because they weren't filled correctly. This is absolutely insane and it could potentially create some surprises (maybe one candidate will do better than projected because this candidate will have spent a lot of time making sure his/her supporters were filling the ballots correctly!). You can see the detailed methodology below but let me simply say this: in order for Scheer to win some of the simulations, I had to make some adjustments. In particular I adjusted my fundraising numbers (so data going up to March 31st) based on the trend observed in the polls between early April to last week. According to Mainstreet, Andrew Scheer has been increasing quite a lot during that time (note: Scheer has always polled higher than what the fundraising data suggested). 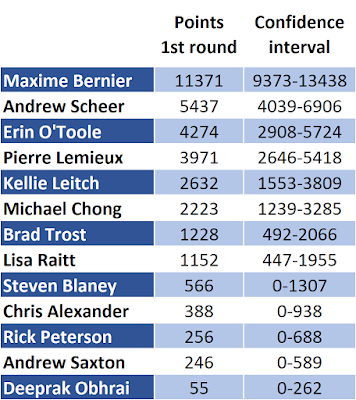 I used the trend in the polls not only to boost Scheer (well I adjusted everybody but Scheer is the one who benefit the most, along with Lemieux) in the first round, but in the other rounds as well (since I also adjusted the intentions among the 2nd, 3rd, etc, choices). - Scheer to be underestimated in the polls and fundraising data. We are talking of a systematic bias here where Scheer overperforms the polls/fundraising in multiple provinces. - Scheer to receive way more second votes than what the data suggests (and Bernier way fewer). The path to victory for Scheer relies entirely on the polls/fundraising data being wrong. And quite wrong actually. So while it's possible, especially when we remember how unpredictable leadership races can be, it remains unlikely. 1. Using the fundraising data available on Election Canada, I looked at the share of donors and shares of amounts for each candidate in each province for the first quarter of 2017. Ideally I'd have looked at the riding level but then most ridings would only have a couple of data points. Province level isn't perfect but it captures some of the disproportions introduced by the electoral system. Based on my research for the various leadership races in Quebec, it's not clear if the amounts or the number of donors is the best indicator. I thus averaged the two. 2. Given the number of points in each province (number of ridings x 100 points), I then allocate these points proportionally. As mentioned above, we would technically need to do it riding by riding. But unless one candidate has a crazily concentrated support in a few ridings in a province, my method should give us a good idea of where each candidate stands. 3. For the redistribution of the votes of the candidates that are eliminated: I used the information from the data of the donors who contributed to more than one candidate. This gave me a big matrix of cross-voting intentions. For instance, I could see how many donors contributed to both the Bernier and O'leary campaign. Again, far from a perfect measure but it's better than nothing. 4. Adjustments based on polls. As I said, the only good polling data was from Mainstreet. But I wasn't gonna pay $110 a month to have access (actually $1000 if I wanted to then use the data on my blog). With that said, Mainstreet published the data publicly on some occasions. One of them was for the period going from April 11 to 13 (thus not too far after the end of the fundraising data going up to March 31st). Another was April 29-30 (thus providing us with a good idea of what happened after O'leary dropped). Finally, they published one last week, conducted between May 11 to 14. Maybe surprisingly, the numbers I got with the fundraising data were actually quite close to the ones from Mainstreet. Bernier would usually be higher using the fundraising data, so would Leitch, while Scheer would be a lot lower for instance. Again though, overall it was quite similar. I thus adjusted my numbers partially to the polling ones. More importantly, in order to account for the trend between early April to now, I adjusted the numbers based on the trend in the polls. I used the same adjustments for the second choices. These adjustments help Scheer quite a lot. As a matter of fact, without them Bernier was winning 100% of the simulations. 5. Simulations: the share of a candidate in a given province is randomized. For instance for Bernier in Quebec, his share is around 50%. In some simulations it's only 40% while in other it'll be 60%. The margins of error used were of 7%, thus much wider than for my typical simulations for an election. Why? Because leadership races are more unpredictable. For the 2nd (and subsequent) choices, I also randmonized. So in some simulations many supporters of Leitch would then vote Bernier while in another simulation they'd go to Scheer. Here the margins of error are of almost 10% because we really have limited information regarding these second choices. I repeated this process 10,000 times, each time until one candidate reached 16901 points. I then counted the number of wins to get the probabilities of winning. J'ai écrit sur ce sujet à plusieurs reprises déjà mais avec le dernier sondage Léger et le congrès de Québec Solidaire cette fin de semaine, les discussions sur une éventuelle alliance électorale entre le PQ et QS vont bon train. Sleon le sondage Léger, une telle alliance récolterait 39% des voix, loin devant le PLQ et ses 29%. J'ai déjà exprimé mes doutes sur ces chiffres dans mon billet d'hier, mais regardons cela de plus près. Premièrement, je crois que toute simulation d'une telle alliance se doit de partir du principe que le PLQ ne perdra aucun de ses électeurs. Le sondage montrait les Libéraux passant de 32% à 29%. Cela n'a pas de sens. Le PLQ conserverait tous ses votes et en recevrait des nouveaux: quelques rares électeurs de QS ou du PQ qui ne voudraient pas d'une telle alliance ainsi que certains électeurs CAQ qui se rangeraient derrière le PLQ afin de contrer cette coalition. Deuxièmement, je crois aussi qu'il est important de tenir compte du fait que certains électeurs PQ et QS refuseront cette alliance et ne voteront pas. Le sondage Léger n'avait pas cette option. En me basant sur les précédents sondages sur la question, j'ai ainsi estimé que 10% des électeurs PQ et QS ne voteraient pas en cas d'alliance. Aussi, soyons clairs, l'alliance en question n'est pas une fusion ou coalition mais un retrait mutuel de candidats dans certains comtés. Les partisans Péquistes et Solidaires ont toujours montré qu'ils suivraient une telle alliance. Le dernier Léger confirme cette tendance. En gros, 80% (et plus) des électeurs de ses deux partis soutiendraient un tel candidat unique. Remarquez que les sondages n'ont jamais séparé ce taux en fonction de si le candidat unique est du PQ ou de QS, mais oublions cela pour l'instant. Un parti qui semble toujours fortement affecté est la CAQ. Cette dernière perdrait des électeurs au profit du PLQ (mentionné ci-dessus) ainsi que du PQ-QS (imaginons des électeurs qui voudraient vraiment se débarasser des Libéraux et verraient cette alliance comme ayant les meilleures chances). Une polarisation du paysage politique québécois ne serait pas une bonne nouvelle pour le parti au milieu. Vous pouvez le voir, on est loin des 39% du sondage. Je trouve cela normal. Le PQ est à 24% et QS à 14%. Une alliance ne peut pas donner lieu à un résultat plus grand que la somme des deux (même en incluant les reports CAQuistes). Mes calculs reposent certes sur certaines hypothèses, mais je trouve les résultats bien plus crédibles que les chiffres du sondage. En termes de sièges, voici les résultats. Remarquez bien que j'ai mis un candidat unique dans les 125 comtés. Dans bien des cas (les 27 sièges PQ et 5 sièges QS avant l'alliance par exemple), avoir un candidat unique ne fait que renforcer la marge de victoire ou ne change rien (le PLQ gagne toujours dans Westmount). Je l'ai souvent dit: le vrai défi est de trouver la liste des cicrconscriptions où un tel candidat unique serait utile. Nous savons qu'Amir Khadir a une liste de 30 comtés. Voyez le résultat ci-dessus comme le borne supérieure de ce qui pourrait arriver. Car en réalité, il est fort possible que le PQ et QS fassent le "mauvais" choix de certaines circonscriptions. Après tout, la liste des comtés où une division du vote opère dépend des intentions de votes. Et celles-ci peuvent changer rapidement. Alors, cette alliance, une bonne idée? À première vue, oui. Mais il y a plusieurs bémols. Tout d'abord, remarquez qu'une telle alliance ne gagnerait qu'une toute petite majorité. Une minorité serait possible. Ensuite, le PLQ n'est pas vraiment affecté. Ce n'est pas la première fois que je montre cela. Aussi, les résultats ci-dessus dépendent en bonne partie de la réponse non seulement des électeurs PQ et QS, mais également de la CAQ. Si Legault arrivait à conserver plus de 80% de ses partisans, les gains pour le PQ-QS seraient moins importants. Au final, il y a un potentiel certain pour un accord électoral entre le PQ et QS. Mais entre psoer une question hypothérique dans un sondage et le faire en vrai, il y a beaucoup de différences. De plus, un tel accord ne garantirait pas une majorité au PQ+QS. Dans les faits, si l'on tient compte du fait que ces partis ne présenteraient pas un candidat unique dans tous les comtés, cela pourrait ne pas garantir une victoire! Finalement, les sondages et mes simulations ne peuvent anticiper les effets sur la campagne. Celle-ci serait fort différentes. Par exmeple Couillard (et Legault) passeraient leurs temps à dire que le PQ et QS proposent la même chose, etc. Quelques jours après le sondage Mainstreet qui a généré bien des discussions (at attaques...), voici le dernier Léger. Je n'ai pas encore le pdf mais nous avons les chiffres . Avant de regarder les projections en détails, comparons les deux sondages, en particulier pour la CAQ. La CAQ n'est plus en tête mais 2e à 26%. Qui dit vrai? Est-ce une différence significative? La réponse est oui et vous pouvez faire les calculs vous-mêmes ici. La taille d'échantillon de Mainstreet est de 1500, mais avec 20% d'indécis. Je n'ai pas le nombre exact entre indécis et "leaning" mais disons 1350 de décidés + "leaning" (je peux traduire leaning par "indécis avec un penchant pour un parti"; Mainstreet pose deux questions: 1. Pour qui voteriez-vous? et si vous êtes indécis, vous avez une 2e question vous demandant si vous penchez actuellement en faveur d'un parti). Les sondages Léger ont en général 1000 observations au total et environ 850 d'électeurs décidés. Toute différence de 3.9 points et plus est ainsi statistiquement significative. Vu que la différence est de 6 points, elle est naturellement significative. Utilisons des simulations pour illustrer cela. Ci-dessous, j'ai simulé 10,000 sondages deux fois. Une fois en me basant sur les chiffres de Mainstreet et une fois en me basant sur Léger. 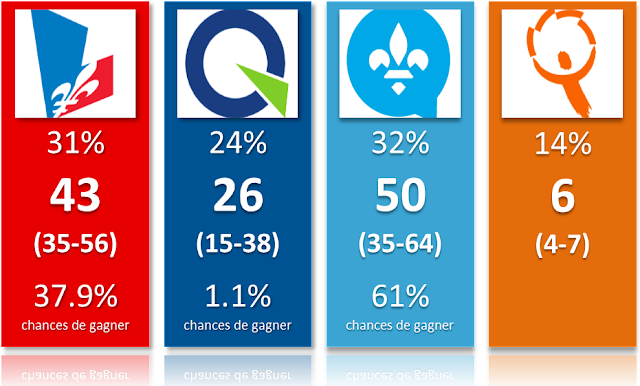 Comme vous pouvez le voir, les deux distributions ne se chevauchent pas beaucoup, ce qui est le signe que les deux sondages ont des chiffres statistiquement différents pour la CAQ. Le 5e percentile (donc le point avec le plus bas 5% des résultats) basés sur Mainstreet est 29.4% (en gros, la borne inférieure de la marge d'erreur). À l'opposé, le 95e percentile de Léger n'est que de 28.5%. Les deux ne se chevauchent pas, les deux chiffres (32 et 26%) sont donc statistiquement différents. 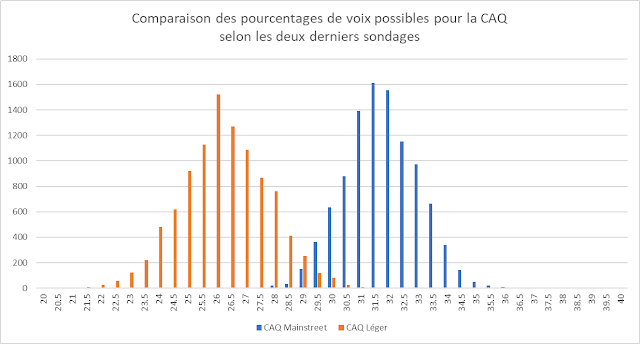 En d'autres termes: Mainstreet et Léger ne s'entendent pas sur la CAQ. La différence ne peut pas vraiment être expliquée par les marges d'erreur. Après, qui a raison? Je vous laisse choisir (note: on ne peut savoir sans avoir une élection). Rappelez-vous cependant que Mainstreet a utilisé des appels téléphoniques non-automatiques alors que Léger fait ses sondages en ligne. En général, la méthode de Mainstreet est considérée comme supérieure mais Léger a une méthodologie solide et davantage d'expérience au Québec. Vraiment, il est impossible de déterminer qui a raison. Aussi, remarquez que si vous êtes un partisan du PQ et espériez que le Léger placerait votre parti dans la course, ce n'est pas le cas. J'avais dit que la CAQ chez Mainstreet était possiblement une fonction d'une vraie tendance à la hausse et des marges d'erreurs, je crois que le sondage Léger nous montre que cette explication n'était pas forcément mauvaise, même si incomplète par rapport au fait que la différence est statistiquement significative. J'ai possiblement une théorie pour expliquer les différences. Le Parti Conservateur est à 3% chez Léger et à 0% chez Mainstreet car cette firme n'inclut aucun autre parti à part le top 4. Je leur ai déjà fait la demande d'inclure au moins le PCQ mais pour l'instant ils ont refusé. C'est un peu dommage car cela rend les comparaisons plus compliquées. Cela pourrait possiblement expliquer les différences avec la CAQ. Après tout, il n'est pas impossible que certains électeurs de droite soient entre la CAQ et le PCQ. Mainstreet, en n'incluant pas le PCQ, "force" certains électeurs vers la CAQ. Juste une théorie. Finalement, il est peut-être étonnant de constater que les deux firmes s'entendent si bien sur les autres partis! Le PLQ est en tête, dans une course avec la CAQ. Tel que mentionné plus haut, le PQ reste 3e et bien loin d'être en position de pouvoir prendre le pouvoir. J'avoue avoir un peu de mal à expliquer les difficultés du PQ mais force est de constater que celles-ci sont réelles. Une explication possible est la forte poussée de QS qui se confirme ici. Après, soyons clairs, QS a déjà été au-dessus des 10% dans les sondages et ce parti a toujours baissé à l'approche de l'élection générale. Il n'en reste pas moins que QS est dans une bonne position actuellement. On entend parler depuis des semaines d'un possible accord PQ-QS (du style retrait mutuel de candidats) et je crois que le Parti Québécois va pousser de plus en plus pour arriver à une telle entente (voir ci-dessous). Le PLQ continue son yo-yo entre élections (>40% en 2003, bas 30% en 2007, rebond en 2008, baisse en 2012, rebond en 2014). À 32%, le PLQ est pas mal à son plancher. Mais vu que l'opposition est divisée, cela permet à Philippe Couillard de pouvoir espérer au moins une minorité (si l'élection était demain). Ajoutez une prime à l'urne et les Libéraux remporteraient probablement une élection si elle avait lieu demain. Ils seraient vraisemblablement minoritaires (64% de chances, seulement 2% pour une majorité). Pour la CAQ, malgré un résultat inférieur à son niveau chez Mainstreet, ce sondage représente une bonne nouvelle. La formation de Legault est 2e place et en progression de 3 points. Si les sondages devaient continuer à montrer cela dans les 12 prochains mois, Legault serait en position de force en 2018 pour se présenter comme la vraie alternative pour défaire les Libéraux. Au final, avec de tels chiffres, la prochaine élection québécoise serait très intéressante et difficile à prédire. Nous avons une course à 3 (au sens large) avec un 4e parti qui est une vraie force sur l'île et pourrait causer des surprises ailleurs. Mais nous sommes encore loin de la prochaine élection. Le sondage Léger contient plusieurs questions sur de possibles alliances électorales. Tout d'abord, la fameuse entente PQ-QS. Selon le sondage, une telle "coalition" récolterait 39% des voix. Cela semble difficile à croire. Ainsi cette alliance récolterait davantage que la somme du PQ et de QS? Cela paraît un peu trop beau. Je suis sensé croire qu'il n'y aucun électeur du PQ qui ne voudrait pas de cette alliance avec QS, un parti bien plus à gauche? Et tous les électeurs Solidaires sont d'accord de s'allier avec le PQ? Désolé mais cela n'a pas vraiment de sens comparé à ce que l'on avait vu précédemment. Oui les électeurs de ces deux partis étaient en général favorables à une entente, mais pas tous. Juste en octobre dernier, seulement 43% des Solidaires étaient favorables à une entente. Sérieusement, j'ai assez étudié cette question (sur ce blogue ou dans d'autres journaux) pour savoir qu'un accord PQ-QS devrait récolter moins que la somme de leurs votes individuels. Oui on peut imaginer que certains CAQuistes se joindraient à cette coalition dans l'espoir de battre le PLQ, mais il reste que les chiffres d'aujourd'hui sont un peu bizarres. Pensez juste à cela: le PLQ perdrait 3%? Essayez de m'expliquer cela. Il y aurait donc des électeurs qui voteraient PLQ actuellement mais pas si le PQ et QS s'alliaient? Qui sont ces électeurs? Le sondage inclut aussi les chiffres en cas d'accord PQ-CAQ (un accord qui n'arrivera jamais, pas pour 2018 du moins) et, tant qu'à faire, une alliance PQ-CAQ-QS lol Désolé, l'exercice est intéressant mais cela n'arrivera jamais. Au moins, avec cette option, vous avez le PLQ à 36%, donc en légère progression (et 54% pour cette super coalition est moins que la somme PQ, CAQ et QS). Je comprends qu'il y a beaucoup d'insatisfaits au Québec. Mais il y en avait aussi une tonne en C-B et les Libéraux ont quand même terminé 1er avec 41% des votes. Unir l'opposition n'est pas facile. Les chiffres ici sont ce que j'appelerais un scénario un peu trop parfait. Oui un accord PQ-QS de retrait mutuel de candidats dans certains comtés a du sens, je l'ai souvent écrit, mais une coalition complète (ou fusion) n'arrivera pas. Et je doute vraiment de ces chiffres, je crois que les questions posées doivent introduire un biais ou les réponses ne sont pas réalistes. Si vous voulez voir ce que ces scénarios donneraient en sièges, vous pouvez essayer le simulateur. Vous pouvez par exemple mettre QS à 0% et le PQ à 39% ou l'inverse. Ce n'est pas parfait mais cela vous donnera une idée générale. Rappelons aussi que le plan actuellement discuté pour un accord PQ-QS ne concerne qu'un retrait mutuel de candidats dans 30 comtés, pas une coalition complète. J'aurais préféré si Léger avait demandé une question concernant un "candidat unique" au lieu d'un accord complet. Aussi, il serait intéressant de voir le report des votes si ce candidat unique provenait de l'autre camp. Ce que je veux dire par là c'est que la situation est différente si le candidat unique vient du PQ ou de QS. Dans le premeir cas, les électeurs PQ ont davantage de chances de continuer à soutenir le candidat. Voici mon article sur la course à la direction du Parti Conservateur. Bernier est de loin le grand favori. Je posterai une mise à jour sur le blogue la semaine prochaine avec davantage de chiffres et détails. Non, ce n'est pas un typo ou une erreur: les plus récentes projections pour le Québec ont la CAQ en tête et un gouvernment minoritaire dirigé par François Legault serait le scénario le plus probable. Cela est basé sur le dernier sondage Mainstreet Research. Petit rappel, cette firme est maintenant très active (elle fait des sondages dans toutes les provinces) et a toujours fourni des chiffres fiables. Ses sondages sont faits par téléphones. Donc svpl ne commencez pas à attaquer cette firme si vous n'aimez pas les résultats. Mon seul reproche est qu'elle n'inclut pas le Parti Vert ou le Parti Conservateur. Aussi, rappelez-vous qu'il s'agît d'un seul sondage et que nous sommes encore loin de la prochaine élection. Je ne me souviens pas avoir projeté la CAQ comme étant favorite. Et il y a encore 1 ou 2 mois, ses chances étaient de 0%. La CAQ progresserait de 6 points (de 26 à 32%) en 1 mois et de 9 points depuis le budget. Je reste un peu sceptique d'un tel bond, ou du moins, j'ai un peu de la misère à l'expliquer. Il est possible que la CAQ profite des affaires de corruption touchant le PLQ et que nous assistions également à une variation d'échantillonnage. Attendons le prochain Léger (ou Crop si cette firme fait encore des sondages...) pour confirmer. Le bond de la CAQ est d'autant plus étonnant que ce parti était traditionnellement très stable dans les sondages (je plaisantais récemment que la CAQ était toujours à 24%). Pour l'instant, partons du principe que ses chiffres sont réels et que la CAQ est effectivement en position de prendre le pouvoir. Une minorité serait probable. 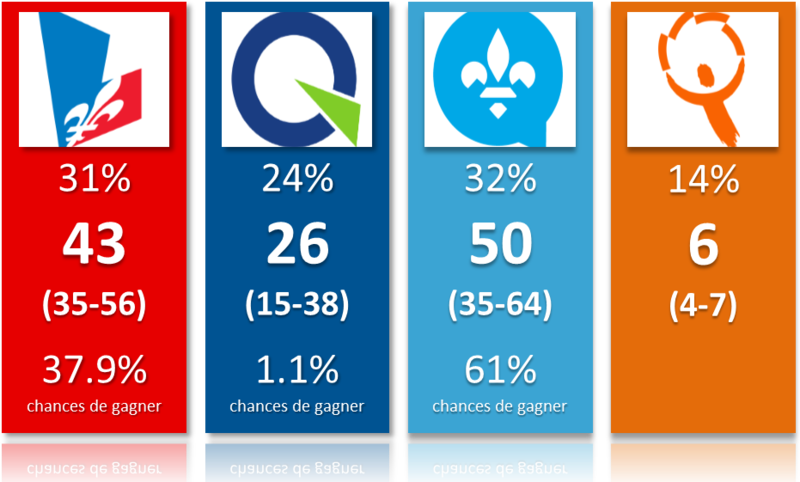 Les chances d'une majorité CAQ ne sont que 7%. Remarquez quand même qu'il est assez incroyable d'être sondé à 32% et d'avoir 7% de chances d'avoir une majorité. C'est ça qui arrive quand une province se retrouve autant divisée que le Québec. La CAQ ferait le plein dans le 450, centre du Québec et la région de Québec. Pour le PLQ, la chute chez Mainstreet depuis l'après budget est brutale: passant de 39% à 31% en 2-3 mois. Là aussi je pense que le PLQ à 39% était dans le haut des marges d'erreur et la chute est accentuée (ou artificielle). Rappelons aussi que le PLQ bénéficie en général d'une prime à l'urne dont je ne tiens pas compte hors période électorale. Pour un parti au pouvoir depuis des années et souffrant d'une insatisfaction chronique, être projeté à 43 sièges n'est peut-être pas si mal. Je crois que la vraie histoire des 6 derniers mois est le PQ et son inhabilité de redevenir une force importante dans les sondages. Depuis son arrivée, Lisée ne semble pas vraiment parvenir à positionner son parti comme étant l'alternative au PLQ. Oui le PQ a bien fait lors des dernières élections partielles, mais il se fait manger sur la gauche et la droite par la CAQ et QS. Le PQ essaie de se renouveler mais force est de constater que cela ne semble pas fonctionner pour l'instant. À voir la tendance sur l'île, il n'est pas impossible d'imaginer le PQ complêtement rayé de l'est de Montréal d'ici 1-2 élections. Regardez Laurier-Dorion, un comté que le PQ remportait en 2004. Selon les projections, il se retrouve carrément 4e! QS se maintient bien au-dessus des 10%. L'effet GND semble perturer. J'écrirai par ailleurs un article sur les partielles du 29 mai la semaine prochaine mais Gabriel Nadeau-Dubois va facilement conserver Gouin. Selon ces projections, QS pourrait même défaire le chef Péquiste dans son comté de Rosemont! Si cela continue, le PQ va vouloir un accord électoral avec QS bien davantage que QS n'en voudra! En terme de potentiel, le meilleur scénario pour la formation de gauche est 11 sièges. Comme d'habitude, on parle ici d'un scénario improbable où QS ferait mieux que les sondages et aurait un vote ultra efficace. Au final, tel que je l'ai mentionné ci-dessus, gardons-nous une petite gêne. Il s'agît d'un seul sondage avec des résultats relativement différents des précédents, en particulier pour la CAQ. Si l'on se concentre sur les tendances lourdes, on voit un PLQ bas mais qui reste dans la course en raison de la division de l'opposition, Québec Solidaire qui se maintient très élevé et un PQ qui continue de se batailler au mieux pour la 2e place. Ci-dessous vous avez la distribution possible des sièges en tenant compte de l'incertitude des sondages ainsi que de la répartition des votes. 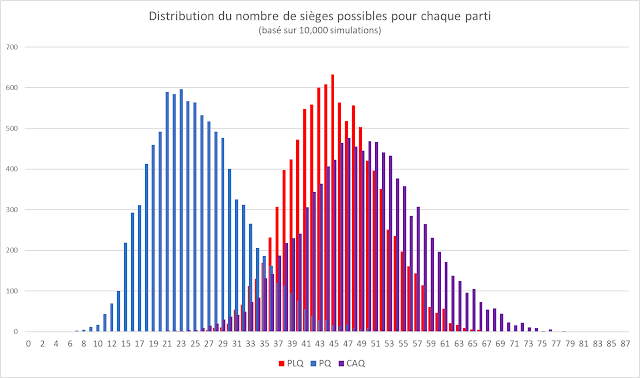 Comme vous pouvez le voir, les distributions des trois principaux partis se chavauchent pas mal, même si le PQ est un peu derrière (Note: je n'ai pas inclus QS dans ce graphique car sa distribution est très concentrée entre 4 et 7). 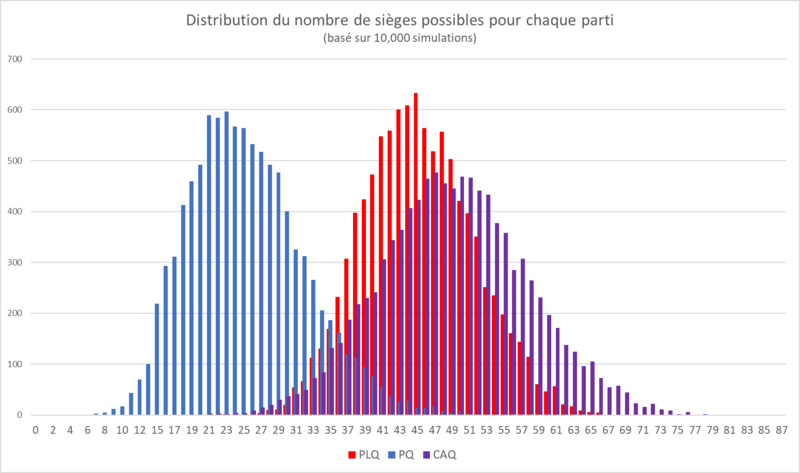 Vous pouvez aussi voir que la CAQ a la distribution la plus "plate" ou élargie. Cela signifie un potentiel plus haut plus un plancher plus bas. En d'autres termes: davantage d'incertitude. Remarquez aussi que la courbe du PQ est asymétrique. Cela se produit car le PQ conserve quand même un nombre non négligeable de châteaux forts. Il reste que le pire scénario possible du PQ est... 4 sièges! Cela se produit 1 fois sur 10,000 simulations. Et ici vous avez les projections détaillées. What a night we had on Tuesday. So many close races, including some that will require a recount. As it stands, it seems the BC Liberals have won a minority but they are literally 9 votes away from a majority. On the other hand, nothing guarantees they'll keep Coquitlam-Burke Mountain after the recount. I just wanted to do a quick comparison of the final projections and the actual (preliminary?) results. Overall, the projections did very well. Sure I projected a Liberal majority but a minority could not have been the most likely scenario, not mathematically. Why? Because there were very few combinations where this could happen. But the final projections did say it was close and it turned out that it really was. Also, some riding polls ultimately causes me to make a couple more mistakes. It's unfortunate but it happens. Here below are the 10 mistakes made by the final projections. For each one, I tried to provide an explanation. Former NDP riding where an independent (ex-NDP MLA) caused a split of the left vote in 2013. It means the left got almost 60% of the vote in 2013. Given that Bob Thompson didn't run this time, I adjusted the numbers for the NDP. My bad. I would do it again though as it made complete sense. Maybe this riding just got a different trend over time (becoming more and more liberals). I don't regret my adjustments as the estimations were showing me that. I had the Liberals up by 5. Right now this is a mistake but let's wait for the recount. This one bugs me. My model was predicting the Green to take it with 36.5% of the vote. Then we got the riding polls from Oracle, including one in this riding showing the Green candidate in third. And all the riding polls on the islands (including the ones from Mainstreet) were showing the Green much lower than expected. So I adjusted. It pisses me off to have missed it because I was spot on before the riding polls. This is really the biggest regret of the night as it would have looked very good for my model to predict the 3 Green seats. I had a very close race leaning Liberals and it ultimately went NDP (for now) by 120 votes. I don't consider this riding as a "mistake" but the call was technically wrong. Another close race that went the other way. Honestly, looking at the candidates, I'm still surprised the Liberals didn't keep this one. Liberals campaigned hard in the North while Horgan didn't. It probably explained this one. Another one caused by riding polls. Without the Mainstreet poll in this riding, I had the NDP ahead and it wasn't even a close race. Then the Mainstreet poll showed the Liberals well ahead so my adjustments made this riding a close call leaning Liberals. My bad as well. I had first hand information regarding this riding and the NDP campaign and it didn't look good at all. I would never have projected such an easy win for the NDP. Election Prediction seemed to agree with me. So, mistakes came mostly for two reasons: a different swing in the Lower Mainland and in the Interior, and some riding polls that were simply off. For the first part, polls were indeed showing that, albeit with a lot of variation. I knew it was likely that the NDP would do better than expected in the Greater Vancouver. I tried to make adjustments but it was giving me a NDP victory and making this party win almost every close race (which is usually unlikely). Also, the riding polls from Mainstreet (and their numbers for the Lower Mainland) in Delta North and Surrey-Fleetwood were showing the Liberals much higher than expected. I had full confidence in Mainstreet and I thought these polls were indicative of a real effect (maybe incumbents would do better). I'm not throwing Mainstreet under the bus but their riding polls were off, both in the Lower Mainland and on the island. I talked to Quito Maggi (the CEO) and he didn't know why they missed by so much. He suggested that maybe the weights based on the 2011 census were outdated. Surrey is a fast growing city after all. Bottom line, I thought about boosting the NDP a little bit in the Lower Mainland but also boosting the Liberals incumbents. The net result was a wash compared to my adjusted projections. Therefore I didn't do anything. The riding polls not only made me changed some ridings specifically, they convinced me not to do any other regional adjustments. When I saw that the Liberals were doing better in both Surrey-Fleetwood and Delta North, I thought it could be a significant signal that the NDP would not sweep Surrey as much as they would based on the regional breakdown of provincial polls. Also, notice that the model performed well in Burnaby and Coquitlam. It's really in Surrey and Richmond that it failed. Richmond is where the NDP increased the most! Not sure what happened but the NDP definitely got more popular among Chinese and South East Asian citizens. I regret maybe not paying more attention to some key ridings in the North or the Interior as I could maybe have avoided the mistake in Skeena at least. Overall, I'd say that 2 mistakes came from the riding polls (Cowichan-Valley and Surrey-Fleetwood), 3 were simply close races that went the other way (Courtenay-Comox, Maple Ridge-Mission and North Vancouver-Lonsdale) while the other 5 were due to the different regional swing (along with some weird circumstances in Columbia River). Also, advance turnout did identify Surrey as the potential location of surprises. I wasn't sure if this was indicative of a NDP wave since the NDP was actually pretty stable province-wide. I think that in the future, if I see a region where the turnout is strongly increasing, I'll give a boost to the party that is supposed to increase there. Overall though, as I said, I'm quite happy with the results. The probabilities also worked since 55% of the candidates projected with chances between 50 and 60% ultimately won (as it should be then!). I'll wait for the final results to do a comparisons of the percentages projected and actual. Also, the biggest surprises were actually not when I made mistakes. For me the biggest ones were the high NDP vote in Richmond (where they almost won a seat) and in False Creek. In these ridings, I made the right call but it was much closer than expected. Can the Green win more than 3 seats? Are the BC Liberals ahead? Is a minority government possible in BC?